Junior Research Fellow (JRF) Agricultural Engg. How to apply : Eligible persons may apply in the prescribed format affixed with colored photographs to be submitted in duplicate along with photo copies of relevant certificates, grade/ mark sheets, publications etc., to Asst. 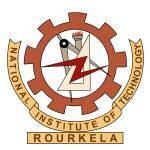 Registrar, SRICCE, National Institute of Technology, Rourkela – 769 008 on or before 25.09.2018.